On Saturday night in Charlottesville, Virginia, a white nationalist group carried torches while they protested a planned removal of the city’s Confederate statues, in an incident that provoked frustration and anger from activists and politicians. The carriers of the torches, which a local newspaper described as several dozen, were reacting to a vote by the city council on November 28 to remove the statute in Lee Park of Confederate General Robert E. Lee. The park in Charlottesville is where the protest was held on Saturday. 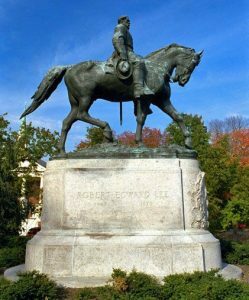 A court injunction halted the statue’s removal for another six months, but that did not stop protesters, who were led by Rich Spencer avowed white nationalist, from chanting slogans while surrounding the statue. Mike Singer, the Charlottesville mayor expressed disgust with the protest on Saturday during an interview with a national television network. Singer called it horrific and said Charlottesville was a city that values its diversity proudly. The mayor said the demonstration coincided with the Festival of Cultures at the park, an event that was created as a celebration of the linguistic and cultural diversity of the community. It was not clear if the timing of the protest had been deliberate said Singer. The mayor released a statement regarding the protest to a local newspaper that said the protest had been profoundly ignorant or had been designed to put fear into the city’s minority community. Singer added that there had been an altercation on Saturday between the protesters and those against them, and that he expected the police to carry out due diligence in determining if evidence existed of a federal hate crime, given the atmosphere being racially tinged surrounding Saturday’s protest. The police department of Charlottesville released a statement on Sunday that said officers responded to a call about there being suspicious activity at Lee Park and upon arriving at the scene found between 100 and 150 people at the park with many carrying torches. When the officer started to approach the protesters, he saw several of them arguing with one man. People in the group carrying torches were chanting while the man was yelling for them to leave town. The officer then ordered the park cleared and called for backup. Upon the arrival of other officers, everyone started leaving the park and no assaults or damage was reported at the location, said police. On Sunday, Singer sparred with a few of Spencer’s supporters with tweets. He called them anonymous trolls, while enduring anti-Semitic tweets.